After an hour long media workout and another 22 seconds of sparring footage has been released, two weeks out from perhaps the richest boxing match in history, we still do not know if Conor McGregor can box. For months, information and footage about McGregor's ability inside the squared circle has been closely guarded. This weekend was supposed to be the big reveal before the ultimate test, but it instead created even more questions. Friday's workout saw McGregor move through a variety of workouts that didn't resemble what professional boxers do. Most memorably, there was his odd arm-shaking warmup that made him look more like an octopus in a washing machine than a boxer, and a strange sequence of long range uppercuts that not even Balrog from Street Fighter would attempt. Claims of McGregor having been “national champion” as an amateur boxer have been disproved by distinct records having been kept of the Irish national tournaments through the years. In the documentary film “Notorious,” a trophy can be seen in his childhood home that seems to denote a victory in a “schoolboy” tournament when he was 15 years old, however. That said, when Showtime cameras visited the gym he trained at as a child, there were no photos of him on the wall because, as his former coach explained, “people stole them.” While it's possible that there are petty thieves stealing photos of children lurking around the gym, it's probably more likely that McGregor's childhood amateur career wasn't all that noteworthy. Everything to do with McGregor's boxing background or boxing ability exists in this grey area of things that can't quite be, or haven't yet been disproved. 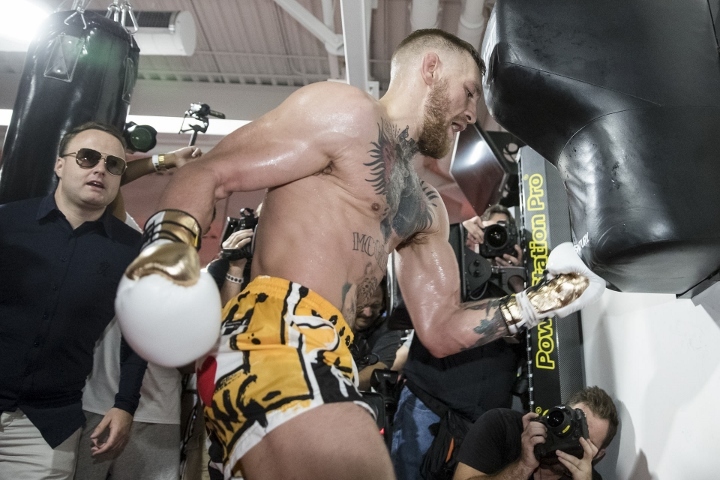 The footage that could have given us a real gauge of McGregor's ability exists in the tape of the two sparring sessions against two-division world champion Paulie Malignaggi. Instead, what was released was a 22 second out of sequence edit of one hard left hand landing, and two messy sequences in which McGregor pushes Malignaggi to the canvas. In fairness, is it impressive that a non-boxer was even able to go the distance in sparring with even a not yet in shape, fresh off the plane former world champion boxer, and land significant shots? It is. But is it proof that he can win a real boxing match against a good boxer—let alone the best of this generation? Definitely not. That said, the element of mystery when it comes to McGregor's ability is crucial to the marketing of this fight. Aside from McGregor's most fervent supporters, if people were to see McGregor's actual amateur credentials, or get a lengthy look at his ring ability, they might just choose to keep that $99.99 in their pocket instead. But as long as most people aren't privy to that information, there's still enough to latch onto to make this event worth watching. The very fact that a man with zero pro fights is audacious enough to challenge one of the best practitioners the sport has ever seen is novel enough to compel people to watch. Any time an elite athlete tries a sport other than his or her native one, it's enticing. Tim Tebow switching sports was enough to get people to watch Low-A baseball for at least a month earlier this year, so why not watch someone try something new for 36 minutes or less? What's interesting about this promotion is that it goes beyond just seeing if an MMA fighter can hang in a professional boxing match—it's actually attracted people who think he can win. This isn't just seeing if Tim Tebow can be a decent minor league player, it's suggesting than Tim Tebow is better than Mike Trout. In reality, it would be a colossal victory and endorsement for McGregor if he were to go the distance with Mayweather, or was even mildly competitive for a couple moments in the fight. However, McGregor fans have taken both the lack of information available on their charge, and the confusing and concerning nature of the footage that is available, and have spun it into a positive. In their minds, McGregor's awkwardness and lack of traditional technique will actually work in his favor. Some have suggested that by doing everything a different way, that he will revolutionize boxing, comparing him to famous inventors and inventions of years past. They would suggest that, for example, McGregor's long-range reaching uppercuts, which are taught to be foolish to boxers from a young age, will be so surprising that they will befuddle Mayweather completely. This suggests that boxers remove the possibility of low-percentage punches from their consciousness, and when encountered with an inexperienced opponent throwing one, would simply stand stock still as their nervous system short circuited and take the punch flush, as opposed to seeing a glaring opportunity for a massive counter shot. Almost every great boxer throughout history did at least something “a different way,” and had their own unique calling card. Even Mayweather, while not the “inventor” of the shoulder roll by any means, has a style that is very much his own. But the difference is that Mayweather and all of the great boxers before him are still masterful technical boxers, just with their own twist. They understood the craft, then adapted and furthered it. McGregor hasn't demonstrated a sufficient understanding of the craft to make a reasonable person conclude that he will revolutionize it. Is it theoretically possible that he could be the fighter that changes boxing fundamentals forever? If it is, the odds of it are sure wider than 4 to 1. Tags: Mayweather vs. McGregor Conor McGregor Floyd Mayweather Jr. This is not "enticing" as the author claims, it's a fcking scam from beginning to end and should be treated with the contempt it deserves. Not 10 articles every fcking day! Conor's girl had a hell of a time this weekend looks like.